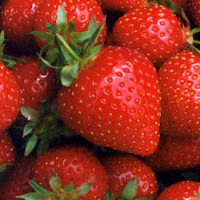 Strawberries are a real treat and in the Netherlands they also go by the nickname 'Summer Kings'. There are many different kinds of strawberries, but the most common one is the Garden Strawberry, which is specifically grown for consumption. The Garden Strawberry is actually a cross derived from two different species: one that had lots of flavor and another one that had the large size. It was cultivated in 1740 for the first time and replaced the Woodland Strawberry which had been grown for consumption since the early 17th century. Straw was originally used to grow these berries, hence the name. Strawberries qualify for three Superfoods categories: Brain, Heart, and Antioxidant. Eight medium strawberries (147g) provide more than 150 percent of the Daily Value of vitamin C, and are excellent source of manganese, as well as a good source of fiber, all for 45 calories. In addition, strawberries are loaded with brain healthy antioxidants, such as anthocyanins and quercetin, making them a Superfood for your brain. UCLA researchers found that strawberry extract suppressed proliferation of colon, prostate, and oral cancer cells. Tufts researchers found that strawberry-supplemented diets slowed and even reversed brain decline in animal studies. Another strawberry compound -- C3G -- could help with weight management by regulating appetite and increasing fat-burning. More vitamins and nutrients found in these little red delicacies are: folic acid, potassium, riboflavin, vitamin B5, vitamin B6, copper and omega-3 fatty acids. It may well be that you are allergic to strawberries. Researchers suspect this may be contributed to the red pigment in the fruit. Good news: there are white/colorless varieties available to which you may not be allergic to. Strawberries serve many purposes: they can be eaten fresh and can be frozen, dried, used for making preserves and pies, and added to all kinds of dairy products like flavored ice cream, milkshakes, smoothies and yogurts. You will have no problem finding many more recipes with strawberries. The best way to keep strawberries fresh for at about 3 days is to spread them in layers either in a plastic container or a plastic bag. Place paper towel in between and refrigerate them. Only wash them when you are ready to use them. It is quite common to resort to comfort foods when we are afflicted. Strawberries would be a good, sweet and healthy alternative to replace all the greasy and unhealthy snacks. Eating only gives comfort for a moment though, but God's comfort is everlasting. Always love to eat strawberry. Lots of vitamins that are good for the health. But here in our place its very expensive. It has potassium, fiber and folate that fights against heart disease and stroke. But here in our place stawberries are very expensive. I am sorry to hear they are so expensive, but bananas may be a good alternative.